Now that you’ve picked up the stitches for your edgings and bands, it’s time to think about making buttonholes. Because buttonholes–and the fabric that they’re in–are stretchy, you need a smaller hole than you would in a woven fabric. My general, non-scientific rule is this: you should just barely be able to get the button through the hole. Over time, the buttonhole will stretch, and you need to allow for that. A basic eyelet (yo, k2tog) makes a fantastic all-purpose buttonhole. It works well no matter whether the buttonhole band is worked vertically or horizontally, and fits any shape of button. If you want the hole to be a little smaller (the “little eyelet” in the photo above), work only the k2tog, and skip the yo. 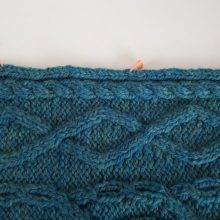 On the following row, pick up the strand that sits where the yarnover would be, from front to back, and work into it through the front so that it is untwisted, to create an open stitch. (This is basically a failed make 1 increase.) Just work the yarnover as the stitch you need it to be: in garter, you’ll knit it. 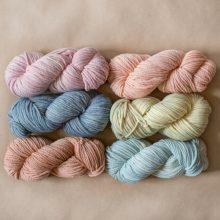 In stockinette, purl it on the WS. 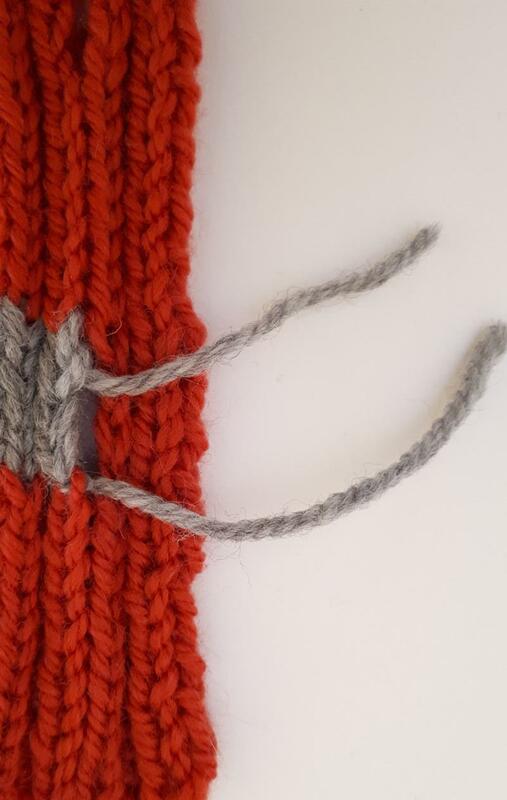 If you’re working it in (k1, p1) ribbing, careful placement is key. For the best look, position the buttonhole so that it’s worked over a (p1, k1) pair. The yarnover replaces the RS purl, and the right-leaning k2tog folds the knit stitch over to the right, and hides the decrease. If the pattern ends up with you needing to work the buttonhole over a (k1, p1) pair, shift the buttonhole one stitch to the left, and use a left-leaning decrease instead (ssk, yo). In this case, the ssk disguises the decrease, and the yarnover replaces the purl. 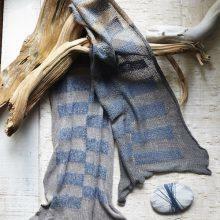 In a larger ribbing repeat, with more knit stitches, just use the (yo, k2tog) version in the knit rib. 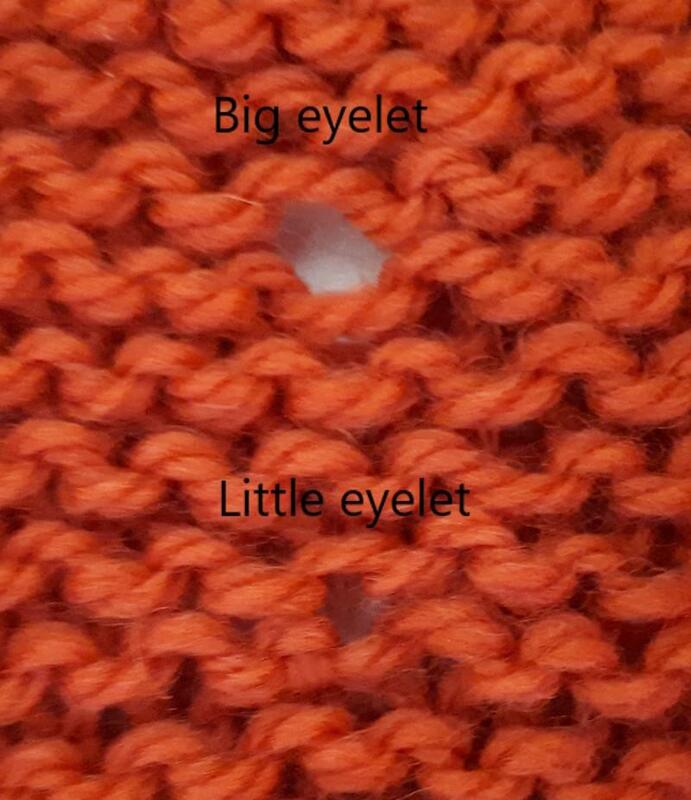 If I’m using an eyelet in a narrow, vertical buttonband, where the buttonhole is placed close to the edge of the row, I like to position the decrease on the edge side, so that it’s a little bit more reinforced, and less likely to stretch out. 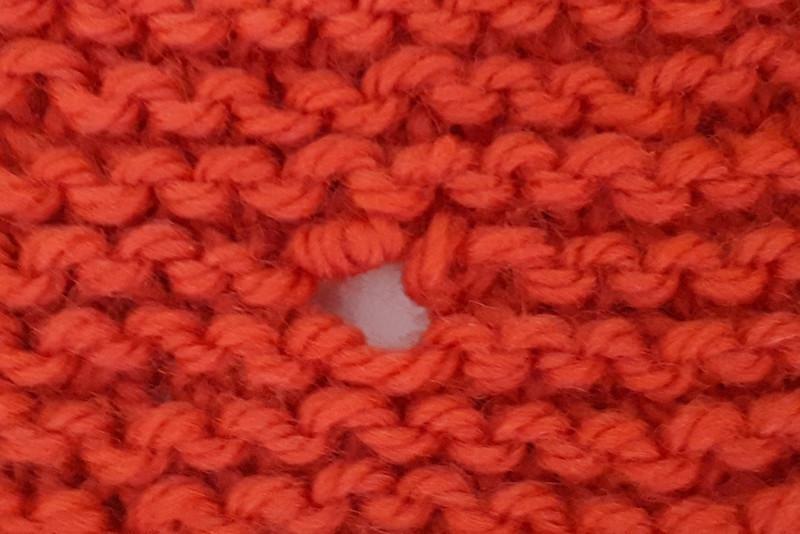 If you need a larger hole—say, if you’re working at a very small gauge, and the button is oversized—work over four stitches: ssk, yarnover, k2tog. (Or ssp and p2tog, as required.) On the following row, work (k1, p1) into the yarnover. To make it even bigger, use a double yarnover – but this will be too big for most circumstances. Work to 1 stitch before you want to start binding off. YO, knit the next stitch and slip the stitch after that (purlwise); lift the yo up and over both of these stitches. (Note that you shouldn’t include this when counting the bind offs.) K1, then lift the second stitch (this was the slipped one) on the right needle over the first, to bind off. 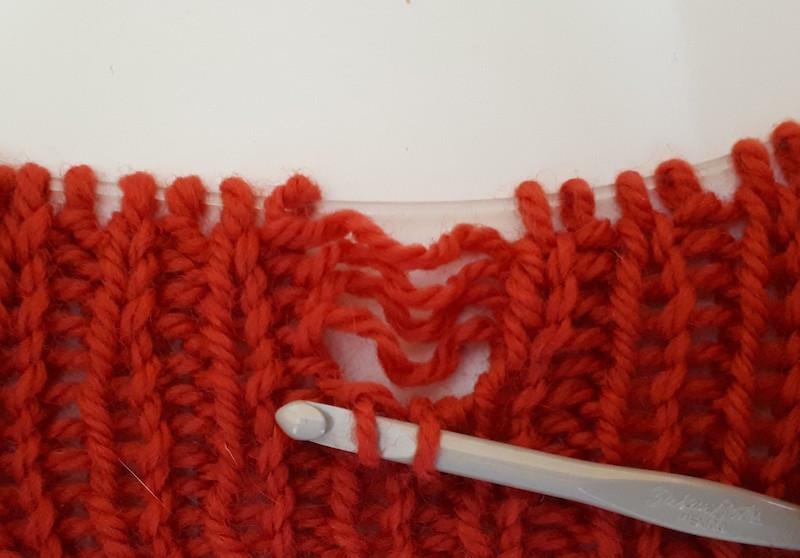 Continue binding off normally, until you’ve bound off one fewer than you intend; slip the next stitch purlwise and then lift the previous stitch over. Finish the row normally. 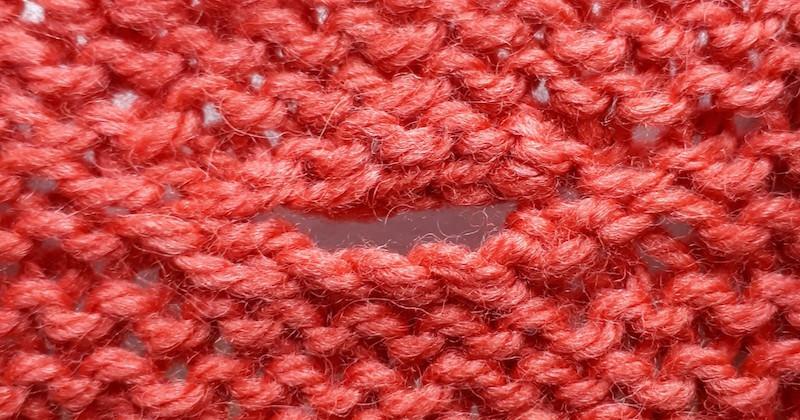 Work to 1 stitch before the gap. 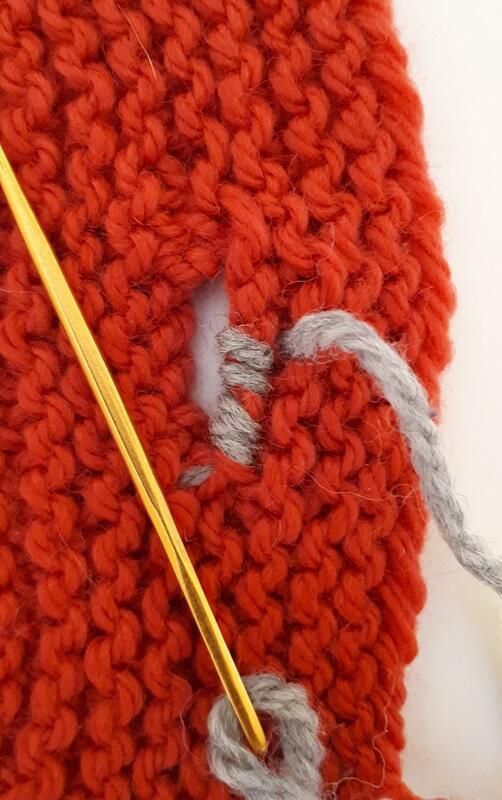 Use the tip of the left needle to pick up the left leg of the stitch just worked (from front to back, as if for an LLI increase); work a kfb into both this strand and the last stitch before the gap. Turn the work and use the cable cast on method to cast on the same number of sts as you bound off. (You’ll have one too many at this point.) Turn the work again, and slip the last cast-on stitch back to the left needle, and then knit it together with its neighbour. (No matter the fabric, this should always be worked as a knit decrease.) Then finish the row normally. 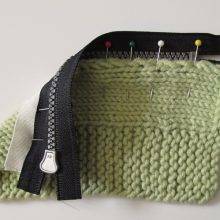 You can create a vertical buttonhole–that is, one where the hole runs up and down, across multiple rows. It’s a bit of a PITA, if truth be told, but it looks very nice. It’s like failed instarsia, in that you use two balls of yarn, but don’t do any twisting. Work to where you want the buttonhole to start. Stop and drop the working yarn. 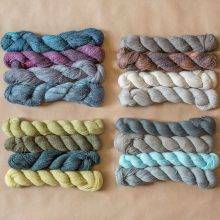 Add a second length of the same yarn – leaving a 4-6 inch tail – and finish the row. From here, you’ll work back and forth for the height you want, working each side of the buttonhole with its own yarn. Slip (purlwise) the edge stitches, on the RS rows, for a clean edge. At the top of the buttonhole, work all the way across with the main working yarn. Cut the secondary yarn, again leaving a decent tail. 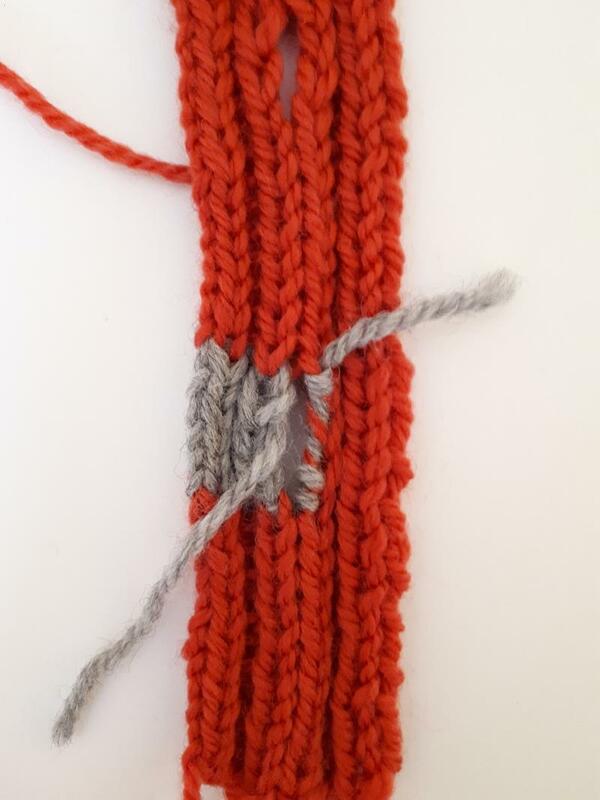 Since you’ve got to weave in those two new ends anyway, leaving them long allows you to reinforce and tidy up the edges of the opening, by working whipstitch with the tails, all the way around. A slipped-stitch yarnover mock cable provides a decorative option, and is a clever solution if you haven’t yet decided where in the band you want the buttonholes to be… there are holes every four rows, allowing you to decide later how many buttons you want, and where you want to place them. Over 5 stitches and 4 rows. Row 1 (RS): P1, k3, p1. Row 2 (WS): K1, p3, k1. Row 3: P1, sl 1 knitwise, k2, pass slipped stitch over both stitches, p1. Row 4: K1, p1, yo, p1, k1. I worked a cardigan with a very deep and shaped horizontal edging, which meant that there was no way I could anticipate the buttonhole position in advance, hence my “unvention” of the afterthought buttonhole, which is excellent as a cheat for a buttonband that’s worked horizontally. Work the buttonhole band to its full length, but don’t bind off. Once you have determined precisely where you want the holes to be, drop down 2 stitches, and use your crochet hook and mistake-fixing skills to turn two normal stitches into a yo/decrease pair, in the row you want. As with the vertical buttonhole, whipstitching around the edges can stop the stretching and tidy up the edges. And if need be, you can reduce the size of the buttonhole by sewing up a stitch or two at the sides. Tradition dictates that for a woman’s garment, the buttonholes should be on the wearer’s right side, buttons on the left. 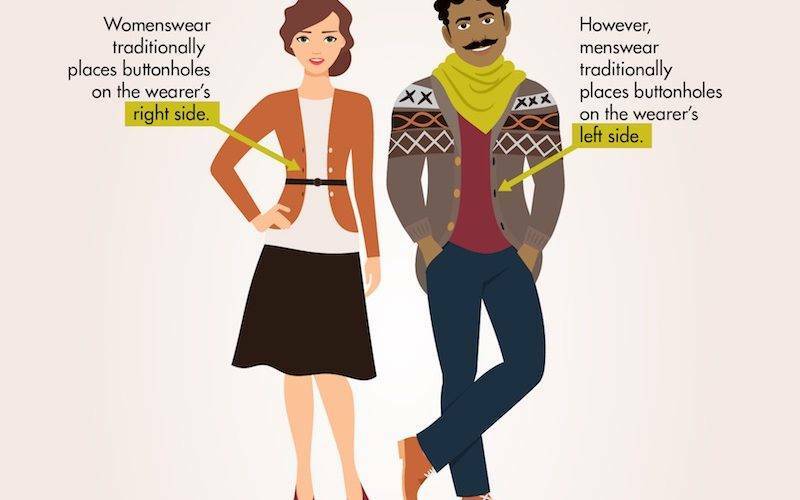 For men, the buttonholes should be on the wearer’s left side, buttons on the right. Whether you care about this is your choice. 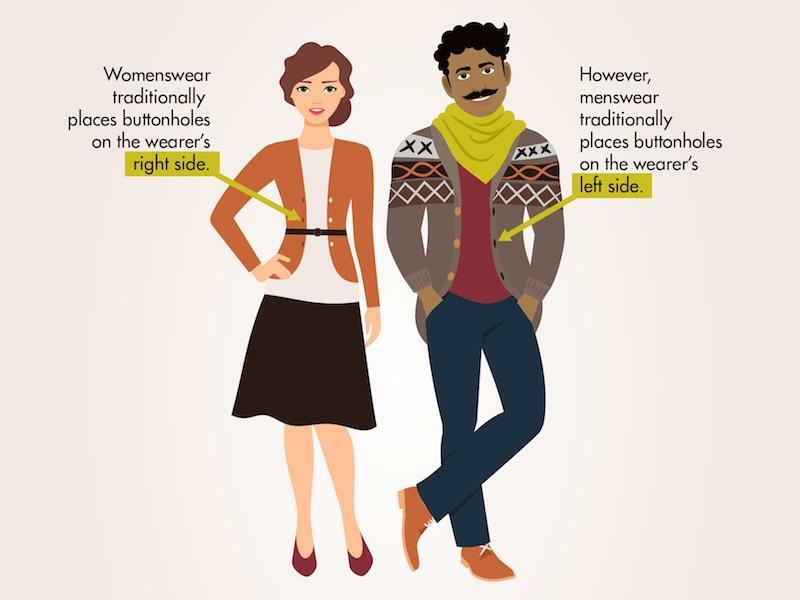 This is one of those situations where it’s generally seen to be OK if women use the men’s positioning, but people have Feelings about men wearing garments with buttons on the “women’s side.” This means that the men’s positioning is becoming the de facto rule for unisex garments. Go with what works for you. 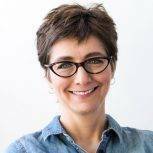 If you’re undecided, take a tip from Elizabeth Zimmermann’s Baby Surprise Jacket: work the buttonholes in the same position on both sides. The ones you don’t use then become a guide for where to sew the buttons. For edgings worked vertically, I recommend either the Eyelet or Vertical versions, depending on the size of your buttons. Place the decrease closest to the edge to reinforce it and reduce the risk of it stretching out. For edgings worked horizontally, use the Horizontal version, so that the finished opening lies vertically. Or just use a shawl pin. Don’t need to make any buttonholes right now, but want to find Kate’s wisdom on the subject later? Here’s how to save this article in your MDK account with one click. You’re a genius, teaching me how to save articles. I had been wanting to do that, and now I have! I’m new here. How do you save articles? I definitely want to save this one! Now I just saw the link at the bottom. Oops. Someday when I have nothing else to do (when I’m dead), I will go back through MDK and save all the articles I might want to find in my next life. It was easy to save! Thanks–this is really worth saving. Thankyou for this excellent guide to buttonholing, Succinct and great photographs. After years of trying and never achieving perfectly aligned button holes and buttons, slipped stitch mock cable trims here I come! thanks so much for putting this guide together—clear instructions and these photos are really helful. saved this! Really love this series! Saved! When I need a small buttonhole, I add a stitch in the first row and then on the way back I drop it and voila! A hole in the knitting. It’s a fast way to do it. Just curious – I was wondering where the tradition of mens buttonholes being on one side, womens on the other came from? Men’s buttonholes were placed on the left so the flap wouldn’t catch on their sword hand when they drew their swords. This is also the reason that Englishmen kept to the left side of the road – so they could draw their swords facing the enemy. Don’t know how they managed if they were left handed! I read one reference which suggested that their trainers tried to switch them to using their right hand. Hi.. Watched so many videos and read so many articles but I understood nothing. Read your article and it’s all done.. thank u so much for this excellent and easily explained article.. you’re just amazing.. lots of love and thanks. How much space do you leave at bottom and top button band before placing button hole? Thanks.